Pruning of bougainvillea bonsai is very important to keep your bonsai in shape and flowering. If you don't prune your bougainvillea tree, it will grow but the shape of your plant will change. 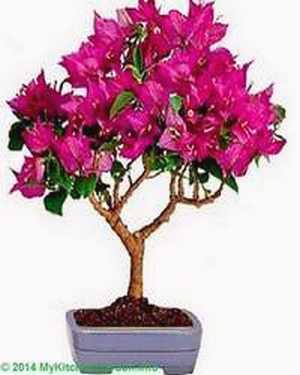 The method of pruning a bougainvillea bonsai is different than that of a normal bougainvillea plant. Detailed information on how to prune a bonsai bougainvillea is given. Pruning of bonsai bougainvillea is an important step to keep your bonsai bougainvillea flowering all year round. Pruning is the technique that will keep the plant looking colorful all the time and maintaining its shape and compactness. You will be required to prune leaves, branches and roots. You should prune the plant in such a manner that it does not destroy the shape of your plant. Prune and shape the tree into an art work of your style. Pinch the tips of the new growth in the branches of your bonsai bougainvillea to encourage bushy growth and flowering. Prune the extra long branches after blooming to encourage the growth. Prune your bonsai lightly once a month during the growing season. This will promote a bushy bonsai plant. Blooms occurs on new growth, so prune after blooms finish. Try to promote a thick trunk by pruning side branches. Remove weak branches and any rotten stems. You have to pinch or cut off a few leaves whenever they grow too much on your plant. Always remove yellow leaves. Use a sealant at the cut after to help the bougainvillea heal and avoid rot. You may also prune the roots a little bit when re-potting every 2-3 years, if they have grown bigger.